Ladies bathing, wearing decorous shifts. Note the two burly ‘dippers’ at the right. Bathing in the sea is a popular leisure activity nowadays, so it’s hard to think of it as anything but a light-hearted, fun pastime for warm days and calm seas. It did not start like that. In the eighteenth century, a typical bather would have been older, sicker and probably terrified at the prospect of going in the water. Only the proclaimed health benefits, plus the strength of the ‘dippers’ who made sure you did what your doctor had ordered, brought people do it. Was there ever a time when large numbers of people were not obsessed with their health and willing to follow the most unlikely and even unpleasant treatments? I doubt it. At least our Georgian ancestors had a good excuse. The eighteenth-century British upper and middle classes suffered from a mess of maladies. Aside from killers like typhus and smallpox, a simple infection could quickly turn into septicaemia. Then there were fevers, stomach complaints, all kinds of nervous maladies and, of course, gout and dropsy. We might recognise that high living, the pressures of an increasingly urban life, insanitary conditions and various viruses and bacteria were to blame. They did not. Amongst the poor, matters were even worse, but few of their betters cared. It had always been thus. While great strides were being made in understanding bodily functions, spurred on by the Enlightenment’s emphasis on experimentation and logic, they still had few truly useful remedies for even the commonest ailments. Without anaesthetics, surgery was always a last resort, while many physicians had little more to offer than the traditional horrors of cupping and blood-letting. Some physicians of the time therefore began to seek out new remedies, based on experimental science rather than the old theory of the balance of humours in the body. Mental problems were even less understood and offered few avenues for treatment. Melancholia – the English Disease – was well recognised as an illness and had been described in detail by Robert Burton in 1621 . But since the term seems to have encompassed everything from what we would now call ‘a pessimistic habit of mind’ through SAD and clinical depression to bipolar disorders, it was hardly surprising that treatments were at least as varied. Sadly, few offered more than palliatives and hope. At first, medicinal spas like Bath were seen as the answer, combining bathing with drinking the mineral-rich water. Most spas were based around hot springs, so any bathing would be based on the absorption of healthful elements through the skin. This remained popular, of course, especially for what we now understand as problems caused by diet, such as gout and anaemia. By the mid–1750s, however, doctors began to be interested in the therapeutic effects of cold water, especially for the effect of shock it would have on the body. Amongst the effete, listless and feeble members of the British upper classes – for so they were seen by many, including some of their own members – a lack of natural vigour could be best dealt with by outdoor activities like fox-hunting, long walks and manly games, away from the smells and insanitary conditions of the town. Of course, many of these ‘cures’ would have been deemed quite unsuitable for ladies. Sea bathing, on the other hand – and drinking sea water, which was usually an essential element in the ‘cure’ – must have seemed a remarkably simple and benign approach, both to the restoration of vigour in both sexes and to many kinds of illness. However, as we shall see, it did not consist of tripping gayly down the beach on a warm summer’s day to gently wade out into the water. What was needed, so most doctors believed, was a strong shock to the mind and body from sudden contact with cold and preferably turbulent water, deep enough from the start to ensure total immersion. Eighteenth-century sea bathing was more of a duty to your health than a pleasure. Most people would not have been able to swim, so being thrown – almost literally – into numbingly cold water at least chest deep would have provided all the shock any doctor could ask for! It is not at all surprising that many ladies were terrified at the thought. Jane Austen, an enthusiastic sea bather, made gentle fun of such terrors in her unfinished novel, Sandition. Her character, Miss Diana Parker, has to encourage Miss Lambe before her first ‘dip in the briny’. Miss Lambe was probably right to be apprehensive. By the mid–18th century the generally-accepted therapy was in use was far from gentle. In fact, it was closer to the modern torture of waterboarding, than what we would call bathing. Early mornings were considered best, so by 5:00 am, sessions would be in progress. Cold was needed to ensure the pores of the skin remained closed, since opening them was thought to be positively dangerous. That was also why cold areas of sea were generally preferred. The bathers were ‘assisted’ to enter roughly chest-high water by attendants, who would then throw them over, often backwards, so they were fully immersed and hold them down for a few seconds. This would be repeated a specific number of times, as laid down by the patient’s doctor. The assistants or ‘dippers’ were strong and determined. Indeed, some of the female ‘dippers’ became notorious for their rigorousness, discipline in applying the doctor’s prescription, and muscular build – to say nothing of their colourful language! Still, some assistance was definitely needed in the interests of safety, as well as to ensure patients didn’t skimp on the process. To ensure proper immersion from the start, as well as somewhere to strip off and leave your clothes, bathing was done from a large-wheeled bathing hut, drawn into and out of the water by a horse. Soaked, frozen and probably gasping for air, the patient would be revived after his or her ordeal with vigorous rubbing, sometimes with seaweed, before being dried, dressed and taken back to dry land for a lie-down and perhaps a cup of tea. There was much contemporary discussion about the causes of disease, which was not surprising in a time before knowledge of infection or genetic difficulties. The broad consensus was that illness was due to the establishment of a negative and harmful pattern in the body’s natural secretions and processes. If a strong, but controlled, series of shocks could be administered, this pattern would be broken up. The body’s natural healing tendency would then be able to re-establish a more normal and benign pattern. That was why the natural response to the double shock of cold water and partial suffocation was thought to have such beneficial effects on the mind and the body. Each would be shocked into creating a new and better balance. The sense of excitement then returning calm after the treatment (mostly due to the body being flooded by adrenaline) was believed to show such s general redistribution of vital processes had taken place. Drinking the salt water purged the body of toxins at the same time. The patient would repeat this regimen first-thing every morning for the selected period, usually days, but sometimes weeks. For those with mental problems, the shock was also thought to ‘stir up’ whatever lay behind the affliction, thus allowing the brain to heal itself by re-establishing a proper pattern of functioning – a little like the supposed benefits of the even more violent electro-convulsive therapy of a few decades ago. Oddly enough, there is even some contemporary evidence that it worked, at least for some patients. Nothing else did. Men usually bathed naked. Women did too, at first, but the groups of men, armed with telescopes, which formed on high ground near the beach showed what would result. That, and society’s growing concerns with modesty and high moral standards, produced several alternatives. 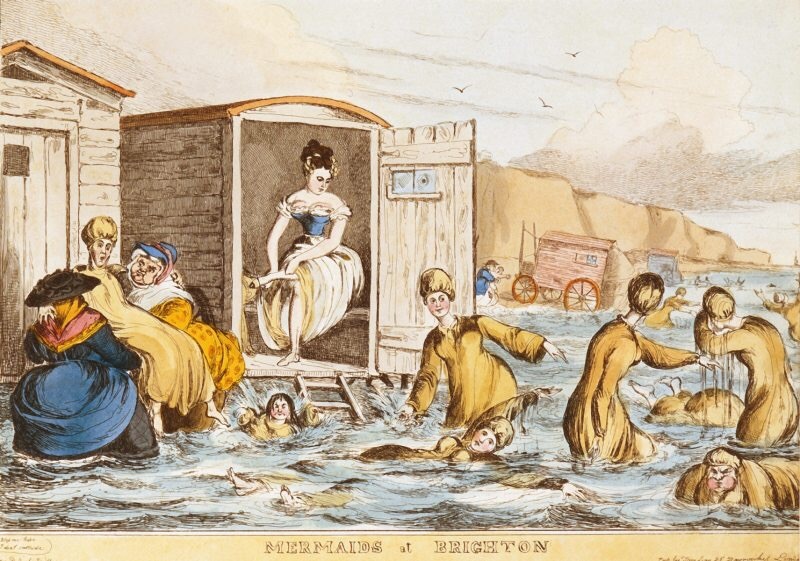 Women might dress themselves, inside their bathing machine, in a long, loose shift. These tended to be wool or flannel and often came with weights sewn into the hem of the skirt to prevent it riding up during the splashing and dunking of the bathing process. Another more extreme solution was to fit the front of the bathing machine with a kind of retractable canopy. It could be extended right down to the water, creating a kind of cavern in which the bathing could take place. Norfolk’s sea was ideal for administering this treatment. The North Sea is nearly always quite cold and turbulent and meets the land in areas without high cliffs or rocky foreshores. The beaches are also within reach of London. However, while some areas possess fine, level beaches, still popular today, others have steep shingle or meet the sea through wide areas of muddy salt-marsh. To take a bathing machine into the water and pull it out again would be little trouble for the horse on firm sand. On shingle, it would be impossible. THE SEA BATHS at Great Yarmouth will be opened on Monday, 13th, May, Instant. These baths are so well known, that it is unnecessary to mention their Convenience and Elegance. Great Variety of Lodgings in the Town, and the bath keeper will wait on Ladies and Gentlemen to assist in procuring them. Less suitable places would not, however, be left out. They might install bathing pools which drew their water directly from the sea. Some even added some form of heating for water, presumably to help revive you after your freezing plunge. Such towns advertised their superiority with vigour, while denigrating their competitors with equal enthusiasm. Even tiny Cley-next-the-Sea, tucked on the Norfolk Coast behind extensive salt marshes, advertised sea baths with the sea water supplied via a tide mill. They also offered hot water baths and suitable accommodation at The Fishmonger’s Arms in the High Street. The medicinal uses of sea-bathing lie at the heart of the British invention of the seaside resort. Since being dunked several times in cold water, and held under until you fear drowning, only takes ten or fifteen minutes (plus time to undress and dress again while the bathing machine was trundled into and out of the water), entrepreneurs quickly saw the potential for profit. A treatment plan might last days, weeks or even months. For all that time, the patient would remain at the place chosen for bathing. They would need accommodation, food and things to occupy their time between dunkings. Not only would doctors offer all kinds of additional treatments, others would provide plenty of entertainment to pass the time. Bathing brought considerable prosperity to small, coastal towns, which was why they competed so much to attract bathers. The presence of so many of the gentry would produce a similar rise in the numbers of professionals, tradesmen, shopkeepers (shopping was as popular a diversion then as it is now) and innkeepers, as well as all the servants and others needed to support the lifestyle of the upper classes. The price of land would rise, developments would be constructed and fresh attractions built. The bracing sea air and ocean breezes were all part of the treatment, whether added via long walks along the shore or drives in the surrounding countryside. While, for the more serious-minded, visits might be arranged to view local antiquities, attend concerts or plays in the nearest large town or enjoy noted vistas. In time, sea bathing moved from the medical realm almost entirely into the sphere of entertainment. Thus was born the resort offering ‘fun in the sun’ and a host of diversions for wet days, cool evenings and time away from the beach. Yet, even today, the medical legacy remains. We still think of sea air as inherently healthy and being on a beach as the ideal break from the stresses of modern living. In a future post, I will be showing readers some of these advertisements and the places to which they applied. This entry was posted in Georgian Society, Medicine & Science. Bookmark the permalink.